While it is purely a concept car right now, General Motors believes that electric propulsion is the future of the automotive industry, so the Chevrolet Performance division cooked up an all-electric version of the COPO drag racing package called the eCOPO. The eCOPO debuted last year at SEMA as the company showed that it can make quick cars with modern technology while also introducing what many people believe is the future of the automotive world. While it was interesting back then to read about the eCOPO and to see it on display, it is a drag car and track action is what we all wanted to see. Fortunately, Chevrolet Performance had the car at the track recently and one YouTube caught the first public run by the all-electric Camaro. In case you aren’t familiar with the eCOPO, here is a quick rundown. Chevrolet Performance started with the lightweight form of the COPO Camaro drag racing package, but all of the components of the combustion engine have been removed in favor of electric components. This includes an 800-watt battery pack and a pair of Borg Warner electric motors that send their power to the rear wheels by means of the same 3-speed automatic gearbox that comes in the gasoline-powered Camaro race cars. 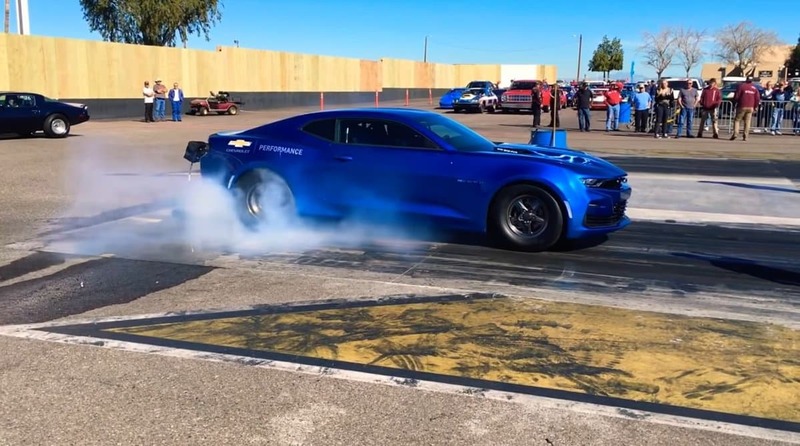 When Chevrolet introduced the eCOPO, the company stated that the electric drivetrain delivered at least 700 horsepower and 600 lb-ft of torque, but the video details claim that this Camaro packs more than 780 horsepower and 780 lb-ft of torque. In any case, the eCOPO has big electric power with the suspension and other drivetrain bits of the basic COPO package. In the video below, the eCOPO takes on a purpose-built race truck that is powered by a loud V8 engine. That prevents us from hearing the lack of sound from the Camaro, but as it does a big, smoky burnout, the lack of engine sound is clear. After the burnout, the eCOPO Camaro eases to the line, stages and prepares for launch. On green, the metallic blue Chevy rips out of the hole, carrying the front wheels high in the air as the car quickly heads down track. It ends up being a close race with the pickup and it is hard to tell which vehicle got to the finish line first, but that doesn’t really matter. What does matter is that this electric Camaro ran a 10.142 at 130.85 miles per hour, leaving no question as to whether or not this electric drag car is the real deal. Best of all, the video details state that the car was only running on 80% power levels, so a 9-second run is definitely in this Camaro’s future.